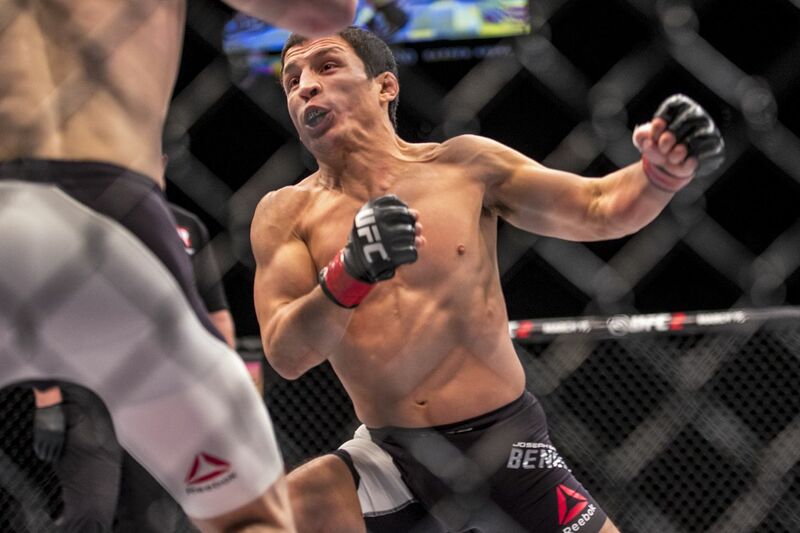 A rematch between Jussier Formiga and Joseph Benavidez has been added to UFC Minneapolis. A flyweight fight between number one contender Jussier Formiga and number two ranked Joseph Benavidez has been added to UFC Minneapolis on June 29th. The promotion announced the matchup on Twitter on Wednesday afternoon. Formiga and Benavidez first faced each other back at UFC Fight Night 28 in September 2013. Benavidez won by first-round knockout in that fight. Since that first matchup with Benavidez, Formiga (19-5) has only lost to current flyweight champion Henry Cejudo and Ray Borg, picking up eight wins in the meantime. Formiga is currently on a four-fight winning streak. Having a great calendar year in 2018 with wins over Ben Nguyen and Sergio Pettis, he recently defeated Deiveson Figueiredo last month at UFC Nashville. Benavidez (27-5) is currently on a two-fight winning streak, picking up a decision win over Dustin Ortiz in January, and a knockout win against Alex Perez in November 2018. The 34-year-old had his six-fight winning streak snapped by Sergio Pettis last June when he was defeated by decision at UFC 225. In addition to this flyweight fight, the UFC also announced a lightweight bout between Drew Dober and Marco Polo Reyes, and a heavyweight fight between Maurice Greene and Junior Albini for the card. UFC on ESPN 4 takes place on June 29th at the Target Center in Minneapolis, Minnesota. The card will be headlined by a welterweight rematch between former champions Tyron Woodley and Robbie Lawler.